Like An Earthquake is a tremendously dynamic and intricate effort; the vocals are provided a proper boost through Crooks’ backing instrumentation. Crooks boldly comes out with her own style, creating an exciting overall backdrop for Little Bird. Turn the Key gives listeners the chance to hear another side of Crooks; this track takes on elements of Melissa Etheridge and early Sheryl Crow. Crooks represents a step forward for the singer-songwriter style, in that the whole effort – vocals and instrumentation – is done with the utmost care. The trend in popular music is to put together a solid set of vocals with a session backing band. During songs like the aforementioned Turn the Key and later-album efforts like Find My Way, Crooks is able to foster a fun and snappy dialogue between the two sides of the band. Little League is a track that operates just fine as a top-40 single, but can be enjoyed by those that want something more with their music. Throughout this effort’s run time, Crooks is able to create a cogent and impressively-detailed narrative. The titular track for Little Bird is a song that is a perfectly-polished piece of pop. The guitar line that steps up when Crooks is between stanzas will tattoo itself deep into the minds of anyone fortunate enough to listen in. 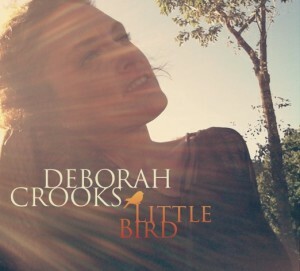 With hit after hit, Deborah Crooks’ Little Bird is something that can stand repeat listening through the cold winter and early spring months. Crooks’ website has information concerning live dates, publicity, photos, and even a biography; listen to Crooks’ works on her domain and let us know what you think about Little Bird.